Indravati National Park is located in the Dantewada district of Chhattisgarh state. Located at a distance of 296 km from Jagdalpur (Bastar), it is situated on the banks of Indravati, a tributary of the Godavari River which flows from east to west and forms the northern boundary of the park with Maharashtra. Hence it's name Indravati National Park. The park attained the status of a National Park in 1981 and declared as a Tiger Reserve in February 1983, under the famous Project Tiger of India. 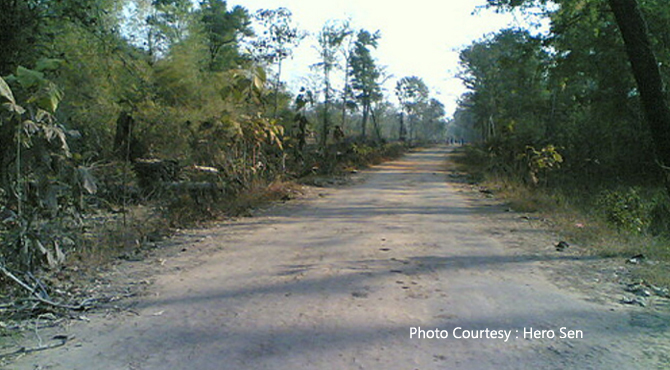 It is the only Tiger Reserve in the State. Spread over more 2799.08 km2 acres of forest, the reserve offers a wonderful wildlife for the visitors. Indravati National Park is one national park in central India where genetically rare wild buffaloes (bos bubalis) are to be found. The reserve is also home to swamp deer or Barasingha. Though tourism is limited there is good scope for wildlife watching birding around the preserve. The park comprises tropical deciduous forest with Teak, Amaltas, Anjan, Arjun, Amlabaheda and Palas. There is profuse growth of bamboos also. The deep forests are interspersed with grasslands and the trees are covered with climbers. The other dominent species besides Dhawa, Saja, Moyan, Salai, Char, Mahua, Tendu, Harra, Bija, Kullu, Bel, Semal, Baherra, Kosum, Lyndia, Shisham, Haldu etc. The national park is a perfect habitat for mammals, reptiles and birds alike. The common mammals found in the park are chital, Sambar, Chausingha, Blue bull, Black Buck, Chinkara, Barking deer, Swamp deer, Wild buffalo, Sloth bear and Wild boar.Tiger, Leopard, Wolf, Jackal, Hyena are important carnivora. Crocodile, Common monitor lizard, Indian chameleon, Common krait, Indian rock python, Cobra and Russell's viper are the commonly found reptiles in Indravati. The Park also gives shelter to the large variety of birds of which Hill Maina is the most important species here. The best season for visiting the park 15th December to 15th June. The reserve remains closed to visitors during the three months of rainy season from July to September.